So what’s it like to spend Christmas in the Middle East? Earlier this week I wrote something for the Telegraph observing that “Christmas in Doha can be a little bit like looking for the lid to a tupperware container in the back of your cupboard, you know it’s there – you just have to search for it”. It’s possible if you’re living in the west, Christmas is just starting to drive you a little crazy. As you’re weaving your way around the supermarket car park looking for a space, you realize Mariah has told you all she wants for Christmas at least four times today. Carols are on high rotation in every department store and every defunct television series from Charles in Charge to Gilmore Girls is currently running their “Merry Little Christmas” special. That’s not happening in my neck of the woods. Christmas travelers fall in to two groups, those who went home and those who didn’t. Those who are home are currently surrounded by family and are lavishing themselves in local produce and Christmas tradition. Those who stayed are dealing with ghosts of Christmas past and maybe hoping to begin a few new Christmas traditions of their own. We’ve tinseled the tree, stocked the advent calendar and put the Merry Christmas sign at the front door, but there’s still something missing. We’ve decorated gingerbread houses, written our lists and checked them twice while talking turkey and trimmings, but still, I feel like I’m searching for something. So what is it? What’s missing? Do I need a mall lined with Christmas trees and window decorations? Do I need to be constantly reminded of how many shopping days I have left? Do I need the office Christmas party, the influx of breathalyzers and the weather man pointing out exactly where Santa is at each point of the globe? I don’t think that’s it. Although it might help, it’s not what’s missing. It’s what’s about to be missed. I want to open a Christmas cracker with my Dad and see him take out the paper hat and try and it put on his head, it’ll rip for sure, it always does. When he does it I’ll remember my Grandfather who did exactly the same thing, we’re a family of fat heads. I want to see my mother rush to Woolies on Christmas eve for the kilo of prawns and the cream for the seafood sauce. I want to a have a glass of champagne with my sister, while we plot our escape from the kitchen for a quick drink at the pub. I want to watch the Little Travelers accost my brother in law, making him put together the lego/scalelectric/remote control car in his hungover state. And when it’s all over and we’ve fought and been our best passive aggressive selves we’ll nibble on cold cuts while the television floats between the boxing day test and the Sydney to Hobart. This year, we’ll be spending Christmas Day with a group of about 25 friends in Doha. They’ll be giggles, secret santas and hopefully a few too many glasses of champagne while the Little Travelers play with friends on the beach. And although there will be no boxing day, no homemade seafood sauce and no ham for breakfast, they’ll be Skype with Grandmas and texts with friends all over the world. It will feel like Christmas because they’ll be Little Travelers and presents under the tree, it will just be a different Christmas. 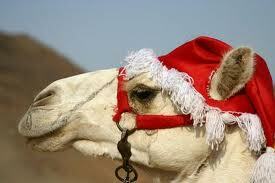 It will be Christmas in the Middle East.